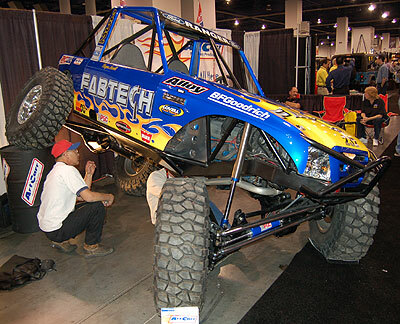 We're at the 2006 Off Road Impact Show to bring you live coverage of this event. The show hasn't started yet, but the Pirate4x4.Com booth is already bustling with activity. We will be hitting the carpet and getting pictures and info on all the latest and greatest that the vendors have to offer. Stay tuned. Be sure to check out our live webcam perched atop Pirate4x4.com headquarters. Brandon "The Knife" Gillen from Anarchy Off Road stopped by with his loveley lady friend Katrina. Check out his website at AnarchyOffroad.com. Well we didn't get much in the name of coverage yesterday. We were slammed all day at Pirate4x4.com headquarters that I didn't get much of a chance to wander around the show and get many pictures. Luckily this show is pretty small in size in comparison to other trade shows such as SEMA, and I can easily cover everything today. We stopped by our event sponsor, Yukon Gear & Axle to see what new stuff they have. One item in particular I thought was pretty cool. 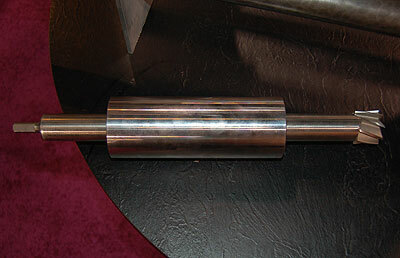 They offer a spindle boring tool to bore out your 30 spline spindles to fit a 35 spline shaft. It may be an over the top tool for the shade tree mechanic, but for the guy who has everything, it's a very cool tool! Brad and Roger Lovell unveiled their new Modified class Ford Ranger here at the Off Road Impact show. The rig is amazing, and I'm sure it works equally amazing. Brad and Roger should be unstoppable this year! 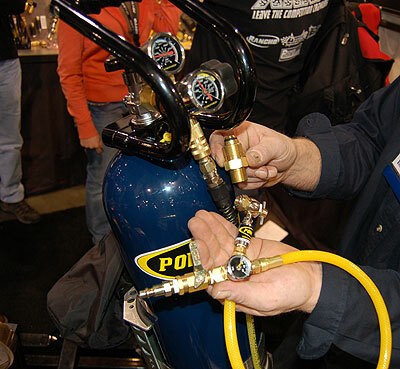 Power Tank showed us their sweet new CO2 and Nitrogen combo regulator. This slick unit comes with everything you need to fill tires to air shocks. I wandered over to the Interco booth and found some BIG tires. Pictured is the 49" IROK, and 47 incher in the background. Last night we attended the Dirt Sports Awards ceremony. 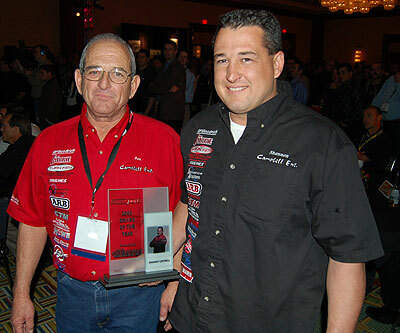 Shannon Campbell was awarded "Driver of the Year" for 2005. He beat out the likes of Robbie Gordon and other well known desert racers for this honor. Congrats, Shannon! This sweet early Bronco attracted all sorts of attention at the Yukon booth. Or maybe it was just the hot red head sitting in front of it that was attracting the attention!